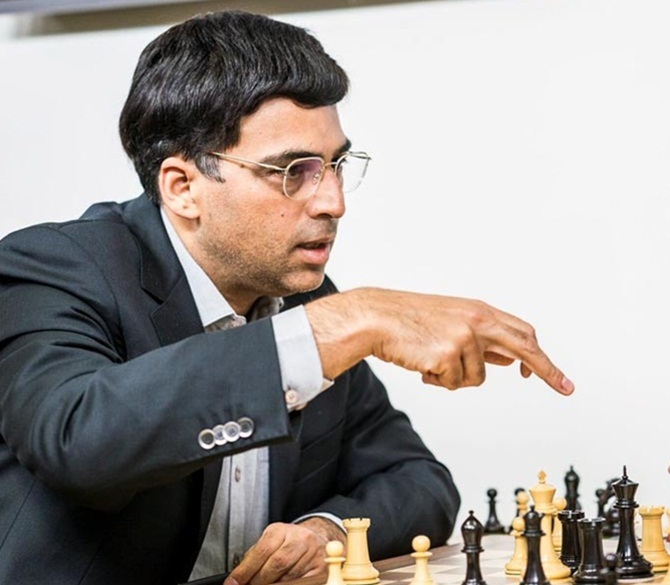 World rapid champion Viswanathan Anand played out an easy draw with world No 1 Magnus Carlsen of Norway in the ninth round of the Tata Steel Masters in Wijk Aan Zee, the Netherlands. Settling for his sixth draw in nine games, Anand took his tally to five points and remains joint-sixth in the 14-player, 13-round tournament. Carlsen employed the Breyer variation as black in the Ruy Lopez and Anand could not get much with his white pieces. The world's top rated player equalised without much ado when Anand parted with his Bishop for a knight and the position was just level when the two decided to split the point in 32 moves. Local star Anish Giri nosed ahead of the field after his fourth victory in the tournament. On the receiving end was Maxim Matlakov of Russia who fell prey to some deft manoeuvres in what looked like a level endgame. Giri moved to a very impressive 6.5 points to emerge sole leader as his was the lone decisive game of the day. The draws on remaining board meant that nothing changed for other participants and Carlsen and Shakhriyar Mamedyarov of Azerbaijan slipped to joint second spot on six points each. Wesley So of the United States and Vladimir Kramnik of Russia remained joint fourth half a point behind while Anand continued on joint sixth spot along with Sergey Karjakin of Ukraine. Grandmaster B Adhiban played a fine game to hold Fabiano Caruana of United States to a draw. Playing black, Adhiban found his counter play in the endgame and drew in 60 moves when only the two kings remained on board. In the challengers section, Vidit Gujrathi was held to a draw by Matthias Bluebaum of Germany. Playing white, the Indian went for a Catalan opening and held a symbolica advantage in one of the main variations. Bluebaum kept finding resources and exchanged pieces at regular intervals to reach a queen and minor pieces endgame that was about equal. The peace was signed in 44 moves. Grandmaster D Harika, meanwhile, held Gujrathi's co leader Anton Korobov of Ukraine to a draw to ensure that the parity remained at the top. Both Gujrathi and Korobov are sharing the lead on 6.5 points each in this section and are 1.5 points ahead of Jordeen Van Foreest of Holland. Results round 9 masters: Gawain Jones (Eng, 4) drew with Yifan Hou (Chn, 1.5); V Anand (Ind, 5) drew with Magnus Carlsen (Nor, 6); Wesley So (Usa, 5.5) drew with Peter Svidler (Rus, 4.5); Shakhriyar Mamedyarov (Aze, 6) drew with Vladimir Kramnik (Rus, 5.5); Maxim Matlakov (Rus, 3.5) lost to Anish Giri (Ned, 6.5); Sergey Karjakin (Rus, 5) drew with Wei Yi (Chn, 3.5); Fabiano Caruana (Usa 3.5) drew with B Adhiban (Ind, 2.5). Challengers: Aryan Tari (Nor, 4) drew with Benjamin Bok (Ned, 4.5); Michal Krasenkow (Pol, 4) lost to Jordeen Van Foreest (Ned, 5); Amin Bassem (Egy, 5) beat Olga Girya (Rus, 2.5); D Harika (Ind, 3.5) drew with Anton Korobov (Ukr, 6.5); Erwin L'Ami (Ned, 4) lost to Jeffery Xiong (Usa, 4.5); Vidit Santosh Gujrathi (Ind, 6.5) drew with Matthias Bluebaum (Ger, 4.5); Lucas Van Foreest (Ned, 4) lost to Dmitry Gordievsky (Rus, 4.5).